@JCTran23 and Ian @BaldguyGreeting Kalman are mixing it up over in one of the corner tables early on Day 2, with Rick Peterson caught in the middle and looking on. There's a bet-and-call on the flop. 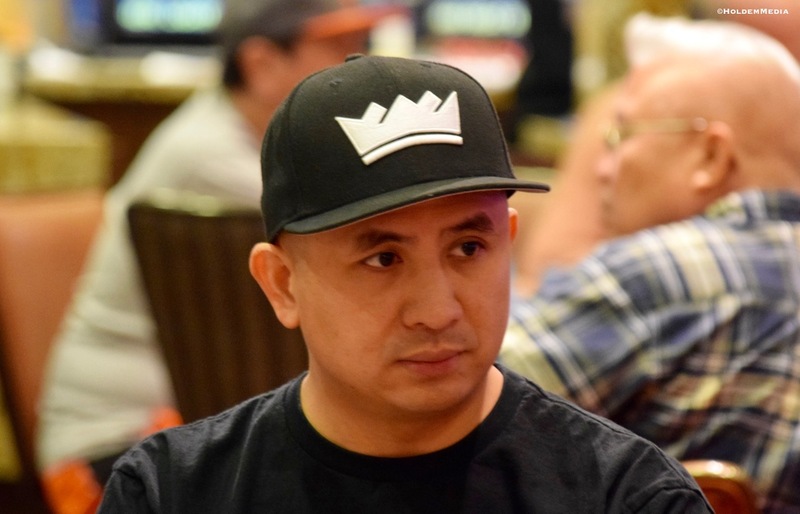 Tran makes it 27,000 from the button on the turn, only to see Kalman - 9th here last eyar in the $2500 HPT Season Championships - check-raise to 75,000. Tran pauses, gets a count, and calls. Kalman checks the fourth diamond - - on the river and Tran check behind. Kalman turns over for flopped middle set that ran out to a flush. He was behind to the river, however, as Tran frustratedly flips 8-9 in to the muck, having turned a straight but managing to maintain a good amount of his stack at the same time. Both Tran and Kalman are at about 350,000 now.